These very simple no-bake cookies have been in my recipe box since 1967. I was invited to dinner at a high school boyfriend’s home, and his sister was making these cookies to have for dessert. When I asked why they were called Cousin Cookies, she told me the story that every time their family visited their cousins in Nebraska, they made these no-bake cookies which they named “Cousin Cookies,” as they became a tradition. I still have the original recipe card from that long ago day and have made them many times over the decades. My girls always enjoyed making them when they were young because they were so easy and have ingredients kids (and cousins) love. 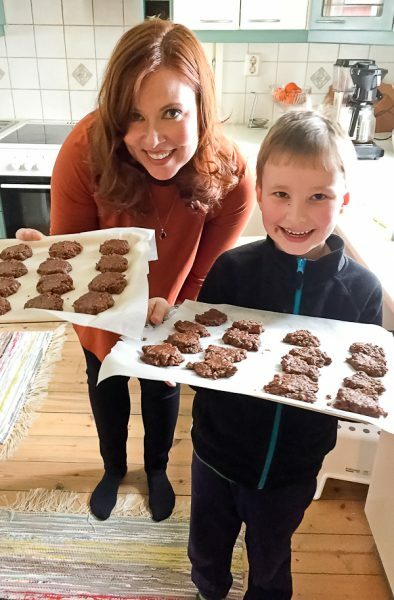 When my daughter Kristina was in Finland a couple weeks ago, she decided to carry on the tradition overseas and make the cookies with her little cousin, Toumas, who has developed an interest in cooking. 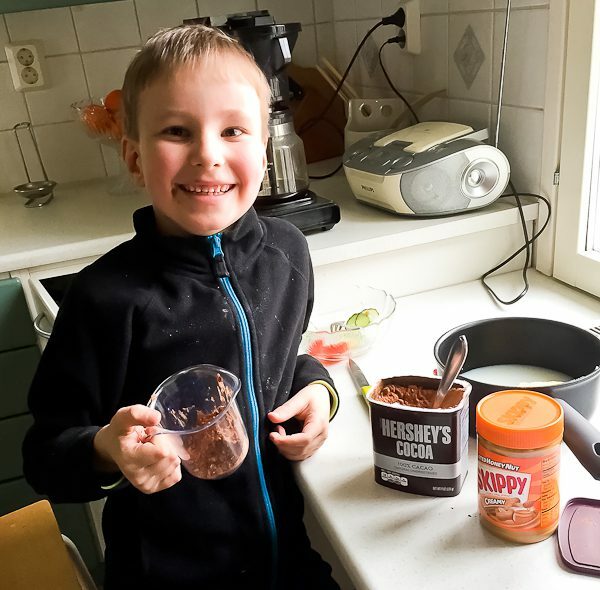 Kristina packed the Hershey cocoa and peanut butter in her suitcase as she knew it would not be available in rural Finland on the family dairy farm. The cookies were a big hit with Toumas and the other Finnish cousins. See how excited Toumas is? He loved helping Kristina! He is a sweetie. The cookies turned out great and Toumas and Kristina were so proud of their results! The cookies are stirred on the stove top, dropped onto a lined cookie sheet, then must chill to harden. Since it’s cold in Finland, there was a natural refrigerator right outside on the front porch! These yummy morsels are chocolate, peanut butter, oatmeal, butter, sugar, vanilla, salt, and milk. Only thing that will have to change in Finland is the name. 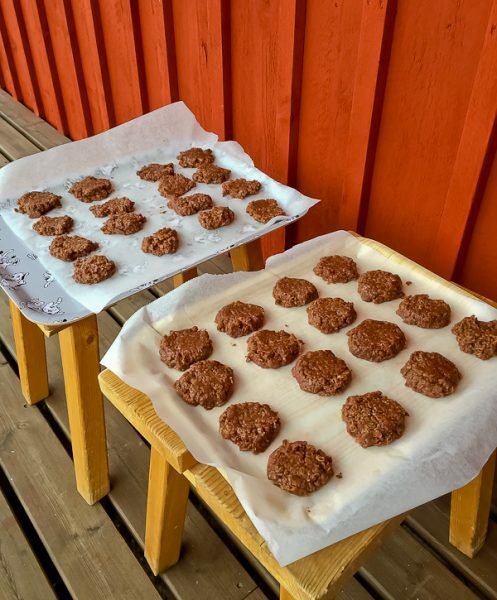 Cousin in Finland is “serkku.” Serkku Cookies, or officially, “Serkkukeksit”sounds pretty good too. Pick your choice of name. 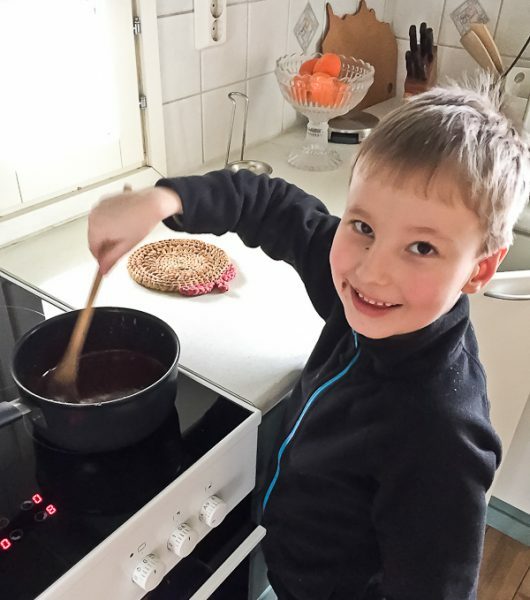 The recipe is timeless, and so is the love of cousins, all the way back from Nebraska USA to Finland. Line two cookie sheets with parchment or waxed paper; set aside. Place sugar, butter, milk, cocoa powder, and salt in a medium saucepan. Heat over medium heat and stir to combine ingredients. Bring to a boil, then boil for a little over a minute until it begins to thicken. Turn off heat and quickly stir in vanilla and peanut butter until blended. Stir in oatmeal until combined. Drop by spoonfuls onto prepared baking sheets. Place in refrigerator to harden. Store in airtight containers or in the refrigerator. The cookies can also be frozen. 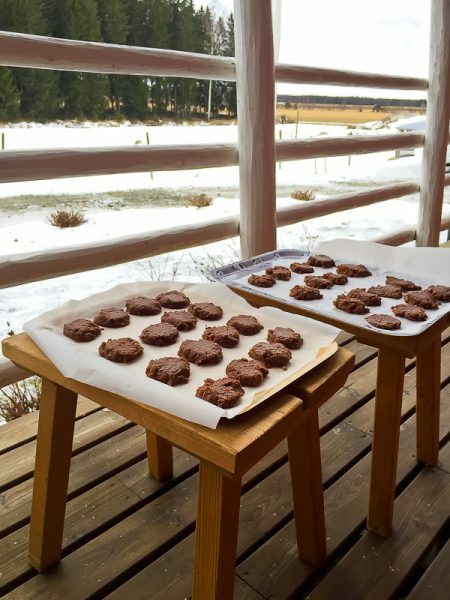 How fun for Kristina to carry the tradition over to Finland and make some Serkku cookies with her Finnish cousin. Love the story. Thanks for sharing. Yay, Kim! You are the first to call them Serkku Cookies! Here is the translated recipe for your international readers! Kuumenna kiehuvaksi sokeri, maito, voi, kaakaojauhe ja suola. Sekoita usein ja keitä 1 1/2 minuuttia. Ota kattila liedeltä ja lisää vaniljauute sekä pähkinävoi. Lisää kaurahiutaleet vasta, kun pähkinävoi on sulanut ja sekoita hyvin. Ota taikinaa lusikalla voipaperin päälle ja anna jäähtyä jääkaapissa, kunnes keksit ovat kovettuneet. Thank you, sweetheart! I love it! Isn’t it the best? The power of food. I’m so happy you liked it, Marja-Liisa! We love our Finnish cousins! Judy! I am thrilled to hear from the original owner of this recipe! I am going to write you a separate email because we need to catch up! It’s been so many years, but doesn’t seem like it at all. I have thought about all of your family so much. Please say hi to your mom for me. I see Jeff on Facebook. I’ll email soon. Thank you so much for writing.